Tour Type: Land tou r + well selected hotel + domestic flights/trains, private guided with your own English speaking guide ( unless otherwise specified), your own driver at your own pace and schedule. Upon arrival in Hanoi, you will be picked up from airport to a hotel in Hanoi for check in and have our welcome dinner. Go shopping & overnight in Hanoi. 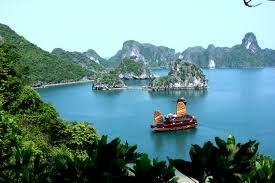 Pick up at your address in Hanoi at 8:30 by Car and drive to Halong. Arrive at 12:00noon. At Halong port, our Crew welcomes you on Junk, enjoy welcome drink & check into your cabin. Lunch with seafood will be served right after. At 13:00, boat starts 3.5 hours cruising into Halong bay to see the amazing karsts with different formations: Mat Qui (Monster’s face) islet, But Moc islet, Cap De islet, Trong (Drum) cave, Trinh Nu cave, to a Floating Fishing village to se this unique way of life… and then explore Luon cave (from 16:40 to 17:30). There will be lots of time for swimming, sun bathing. Enjoy a great sunset dinner and relax under the starlit sky before retiring to the comfort of your cabin. Early risers can enjoy a morning view of Bay’s landscapes with a cup of tea, coffee, fresh fruits. Sitting on the upper deck, we can enjoy the breath – taking beauty of the rocky Islands rising from the crystal-clear waters of the Bay. The quiet is almost eerie; we can hear birds singing, cicadas chirping ashore and the gentle lapping of the waves against our boat, the perfect soundtrack to accompany the fresh air and gentle breeze. And then explore Sung Sot (Amazing) cave (8.00 to 9:00), swim and relax at Titop beach At 9:24, boat start cruising back and brunch buffet will served from 10:30 to 11:30, check out procedure at 11:35. Arrive at harbor by 12:00 noon, and drive back to Hanoi. Arrival in Hanoi at 04:00 PM. Go shopping for a while then have dinner and overnight in Hanoi.